Recently I had a conversation with another blog owner about the number of links included in a blog post; we were specifically discussing guest blog posts but the concept really applies to your own blog posts as well. He stated that he only accepts two links in a blog post and that having multiple links to one blog from within a post is of no real benefit. Do you agree with the lack of benefit? I don’t. To me, including links is a means of giving more depth to whatever I am writing about. For example, if I am writing about good business communications I may link the terms good spelling, using capital letters and consistent style rather than explaining the value and meaning of each. Of course there is also the advantage of potential additional traffic through increasing the number of links to and within my own blog. Even if only one link works for search engines, multiple links give a human more opportunities to visit my blog which is also important. 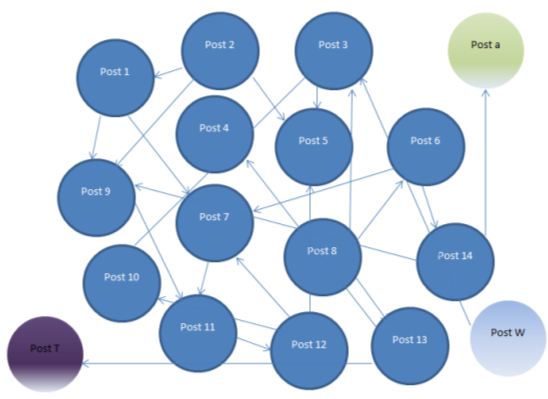 So for search engines, one link in a post may be sufficient but I see other reasons for adding links and judge the correct number of links by the content of the post (if you look through my blog you will see some posts have one or no links while others have many links). Side note: limiting the links allowed for guest bloggers is a reasonable strategy, however, to avoid someone trying to spam your blog rather than providing quality content. I respect such limits and live to them when I supply guest posts, even when I think there are more links of value to the reader. Why do you run surveys or feedback questionnaires? By hand or online, make your survey/feedback questions work for your business. Sometimes, when I read questions in surveys and other forms, I do wonder how important the final data is for the person behind the questions – do they run them for fun rather than as a valid business tool? “When will you purchase a new car? As we purchased a new car a week ago, I couldn’t give an honest answer to that question – we won’t be buying another within 24 months but ‘never’ is wrong, too. TIP: make sure you provide an answer for all possibilities, even if one is ‘unsure’ or ‘don’t know’. If your format allows, ‘other’ not only gives options but can gain more insight for you. Yes I can tell you but the yes answer may mislead you as I’m not pregnant and I assume that’s what you really want to ask me about… I could get really pedantic here and note that I CAN answer but choose not to ( writing ‘please tell us’ or ‘Will you tell us’ are grammatically better than ‘can you tell us’). TIP: Make sure the question is asking for the information you actually want. In this case, the much simpler ‘are you pregnant?’ would have done the trick. If you don’t plan your questions carefully, the results you get can be completely meaningless. For example, if 5% of respondents bought a car recently and answered ‘within a week’ you may mistakenly think the next week is prime time to sell a car. There is no way you can tell that someone gave a false answer to compensate for questions they don’t understand/misunderstand/can’t answer. Depending on how you intend using the answers, skewing results like this can have serious implications. For example, if you plan a marketing campaign and spends thousands of dollars in April when the real results showed September to be effective, you’ve wasted money (in the survey and the marketing). What if you base a new product or pricing structure on the answers collected? Checking, editing, proof reading and rechecking your questions may seem tedious. The details in faulty questions that I occassionally point out may seem trivial. The bottom line, however, is that good survey and feedback questions are more fun to answer, give accurate and useful results, and build your credibility (through attention to detail and simplicity for respondents). The cover or the writing? The mythical they always say to never judge a book by its cover and I think I found an example of it today. The Good Earth, as excellent when I read it some years ago. I picked it up, read the blurb and though ‘why not?’ and bought it. As I put it on the counter to buy it, however, I noticed the front cover for the first time. I had to double check what book it was as the cover looked like a cheesy, trashy romance novel cover – and I choose not to read such books as there are so many books I would enjoy in my limited reading time. If I had seen the cover first, I would not have even read the blurb to be honest, or noticed the author. So it goes to show that the cover is important for getting noticed and influencing decisions. Once I’ve read it, I’ll let you know if the cover or the author was a better guide to its value! A few days ago I wrote about having strategic partners rather than just using suppliers, and how valuable they can be for your business. For example, having someone who knows your business and has strong ethics can provide much better expert support with less involvement from you. It made me think about what is important when choosing partners for your business, and how it is worth spending that time rather than rushing the process. So what are some of the key things to consider when being diligent about selecting partners? service – do you get good service from your partner? That is, do you get prompt responses, respect, your thoughts listened to and clear messages? value adding – does your partner offer information, ideas or extras that truly add value to your business in some way? For instance, if I write some web content for clients I often point out some additional links or improved navigation they could use and a printer I used for a client recently spotted an anomaly and asked for clarification rather than just printing as was. intangible assets – not always easy to judge straight away, but think about how your potential partner meets your expectations and beliefs; are they ethical, do they pay attention to details, do they demonstrate integrity, do they show an interest in ‘being green’, will they respect your privacy and property (including confidential information), and generally be professional. Do you have any partners in your business? I don’t mean a partnership business structure but partners for the business itself, such as a designer, writer or accountant. A true partner (rather than just a supplier you use once for a quick fix) can be a valuable asset to your business and save you a lot of time. So I agree that choosing quickly and without care is not a good plan. I certainly appreciate my business partners – not only do they do great work for me but I can trust them to do so with minimal input from me and maximum expertise from them. So I will take this opportunity to publicly and wholeheartedly thank Ally, Jane (who doesn’t have a website), Michelle and Eva. Have you thought about where your business would be without those partners? Chris Brogan wrote a story in his blog about social media and not being ‘that guy’. In short, the story is that if you’re going on a picnic with friends take a bottle of wine rather than just coming along and eating everyone else’s food. Sounds obvious in that context doesn’t it? The same principle applies in networking (Chris was specifically referring to social media but I am putting it together with all networking). People will respond better if you give something of value rather than if you just try taking. Effective networking is about building relationships rather than selling yourself. What other tips do you have for effective networking?